Get yourself a freaky look of having cracked eyeballs with these amazing ColourVue Sclera Apocalypse 22mm contact lenses. 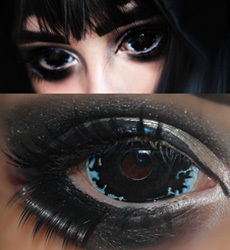 These eye covering black contacts feature a sort of "cracked" pattern on their edge which makes them even more creepy than other lenses from this category. Order them and give them a go now!